Today is a very Happy Day for me! I wanted one so badly for first grade-Check this out! This Book has ELA Standards and Math Standards, too! There are close to 600 pages of worksheets, activities, centers, and posters inside of the book for you to use in your class. I know that personally, I need something get a good feel for before I spend money on it- Well, there is a sample download right there with the book so that you can get a good look inside. I know this is going to be a major time saver when creating plans. 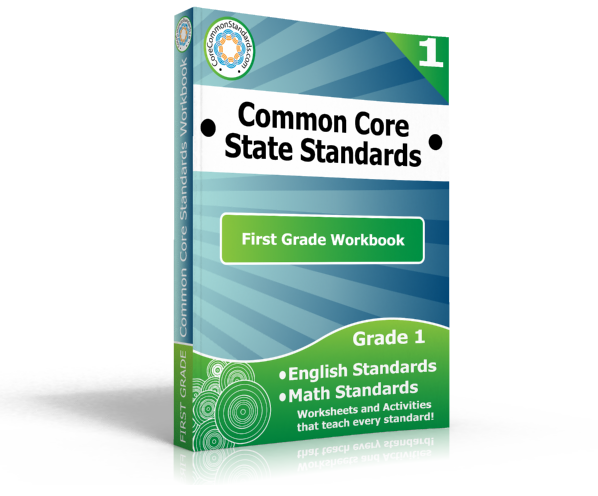 Go to First Grade Common Core to check it out! First Grade Teachers, are you teaching the First Grade Common Core? 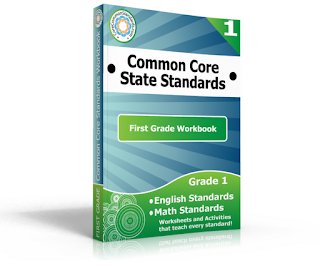 You are going to love the First Grade Common Core Workbook! I'm so glad that you suggested the sample. Based on the outside of the book I was expecting boring and plain worksheets. There are actually really cute activities. I might actually get it now, except for the fact that I'm teaching first and second this year. That will be a lot money... hmmm... might have to look for a grant. Thanks for sharing!